Terra Mítica is in Benidorm, in the privileged Costa Blanca. A region that has an enviable climate all the year through, where you can enjoy beaches and coasts. 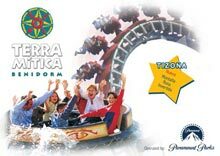 Terra Mítica is one of the best and greater theme parks of Europe. There is a place on shores of the Mediterranean Sea where the adrenalin goes off, the heart rate is accelerated, and where you can feel the emotion even in the air you breathe. A place called Terra Mítica. Misterio de Keops (Mystery of Keops): An enigmatic route inside a pyramid. Cataratas del Nilo (Waterfalls of the Nile): Slide down the waterfalls in a Pharaoh's sarcophagus. Puerto de Alejandría (Port of Alexandria): You can sail aboard of the Egyptian ships that will communicate to you with Iberia. Laberinto del Minotauro (Labyrinth of the Minotaur): Interactive ride where you must avoid the different dangers that appear. Only the adventurers will be able to defeat the Minotaur. La Furía de Tritón (the Fury of Triton): Slide down on an exhilarating fall down water jump that ends into a gigantic wave. Los Ícaros (the Icaruses): You can fly at top speed in these special chairs. El Teatro de Olimpia (Theatre of Olympia): Cinematographic show with lotS of special effects, where armchairs are equipped with movement. Magnus Colossus: The largest and most amazing wooden big dipper in the Mediterranean. On it you will riding a wagon where you will reach speeds near 100 km per hour. El Vuelo del Ave Fénix (the flight of the Phoenix): A frightening drop from the top of a 60 metres high column in only 3 seconds. Tizona: Inverted roller coaster that only lasts 35 seconds with several 360-degree twists. Tren Bravo (the Bravo Train): Small train that makes a course of about 1000 metres and reaches speeds of 50 km per hour. El Rescate de Ulisses (The Rescue of Ulysses): Course of about 400 m2 on boats where you will have to rescue Ulisses from Poseidon's claws. All the thematic areas have typical restaurants, bars, shops, etc., and the theme park has also other services: Automated teller, Telephones, cloakroom and left-luggage, individual or group lockers, kennel, first aid points, lost children point, package pick-up service, post office, fax and messengers, electric scooters hire, wheelchairs and stroller rental, parking, and other services. Terra Mitica has other facilities: bus stops, taxi drop-off, stopping place for suburban train, and a direct exit towards the A7 motorway. If you wish, youc can access to the Webcam situated in Terra Mítica through the webcams network of the Valencian Community.